It is families like Maia’s that make me realize how incredibly blessed I am to have this job. Maia’s mom Guadalupe bravely shares her story as a guest blogger. What this family has endured I can not even begin to fathom. Thank you for trusting me with sharing your story. What a wonderful reminder that miracles still happen! My husband and I were very excited the day we found out I was pregnant with our first child, Maia. The pregnancy was uneventful until the last trimester came rolling around. I remember feeling exhausted, swollen, and breathless. At the time, I thought my symptoms were normal and related to the pregnancy. On Wednesday, June 27, 2018 my husband drove me to Mercy Gilbert Medical Center because I was experiencing chest pain and heart palpitations. I was 34 weeks pregnant with my daughter. During the intake evaluation, the nurse and doctors noticed my heart was racing at 208 beats per minute. The hospital staff immediately paged my OBGYN, he rushed to the hospital and performed an emergency c-section. My daughter was delivered safely and was transported to the NICU since she was born prematurely. I survived three cardiac arrests that night: one during delivery and two more in the ICU. My dear husband observed as the doctors performed CPR determined to keep me alive. I was diagnosed with a heart condition called Peripartum Cardiomyopathy. My heart was severely damaged and the echocardiogram revealed a reduced ejection fraction of 10%. The odds were stacked against us. The morning after my daughter’s delivery, the doctors decided to try ECMO life support in hopes of keeping me alive long enough to find a donor heart. I was transported to St. Joseph’s Medical Center for further treatment while my daughter stayed behind in the NICU of Mercy Gilbert. On July 7, 2018 I was transported to Mayo Clinic for further observation and evaluation. During my time there, the doctors performed various tests and determined that my ejection fraction had improved significantly. ECMO treatment was working! On July 11, 2018 I was weaned off ECMO life support and my heart was holding strong. My daughter and I were both discharged from our respective hospitals on July 16, 2018. I remember crying and feeling nervous on the drive home, I was finally going to get to meet my baby. I felt a sense of relief and joy the minute I held her in my arms. I thank God every day for giving me a second chance at life. I am thankful for having the opportunity to raise my daughter. Miracles do exist and we are living proof of it. Leah and Bobby had prayed for a baby for a long time. After disappointment, loss and heartache they didn't know that God was going to bless them in a miracoulous way. I realized that I no longer had the desire to photograph for profit. Over the last year, after much prayer and faith; God laid it on my heart a couple years ago to create a ministry that provides complimentary portrait sessions to families in need. I worried about what would happen to my current clients. I worried about how to be fair to my fellow photographers. And I worried about how to distinguish families that are truly in need. The reoccurring theme that can be noticed in the above statement is: worry. Lillian has to be one of the sweetest babies I have ever met. She’s always full of smiles! Almost a year later, I haven’t seen this little girl without a smile on her face. She is always so happy! I can definitely say that is something she got from both of her parents, especially her mom. Regina is never negative, the glass is always half full and she always as a joke or two up her sleeve. Her laughter like Lillian’s is contagious. I met Lillian’s mom when we worked together at a local furniture company designing living rooms! This was before I finally decided to take the plunge and go full time with my business. I remember her looking at me saying “When I finally have a baby you are going to take their pictures”, and it totally happened. But life wasn’t always rainbows and sunshine’s for Regina, when she was 20 weeks pregnant with Lillian she had the scare of a lifetime. She suffered from a spontaneous epiderma hematoma in her spine from C4-C7. Surgery was her only option, and with this surgery came risks, not only to Regina but baby Lillian who was still growing inside. Before surgery she was already starting to have trouble with losing feeling and it was starting to spread throughout her body. Regina had a partial laminectomy where a small bone sliver was removed and the hematoma was sucked out. Without this life saving surgery, she would have been paralyzed from the neck down. Doctors think that it was a combination of her excessive morning sickness causing the blood vessels to weaken with an explosive burst in blood pressure, and then moving the wrong way that caused the blood vessel to pop. There are less than 20 cases of this condition during pregnancy since 1865. Today Regina and Lillian are doing amazingly well, they just pulled off some of the best Halloween costumes I have ever seen. The surgery left Regina with a three inch scar from the base of her head to the top of her shoulders. 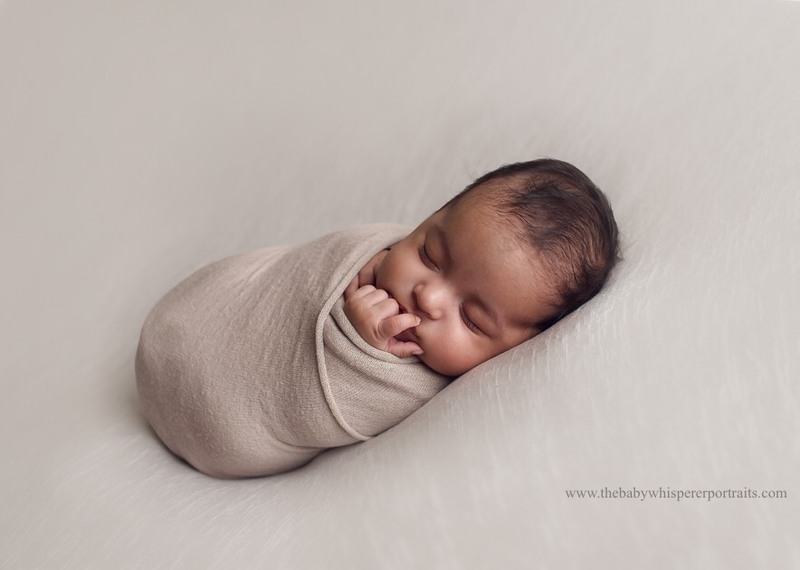 In Lillian’s newborn session she asked if there would be some way to incorporate it into a photo, as a reminder to both of them how strong they were through this process. When we saw the final product both of us had tears! All I have to say is thank goodness for modern day medicine! It saved two lives that day. And I am so grateful to have both of these beautiful girls in my life. I met the Rivera family two years ago when I photographed their oldest son Peter when he was a newborn. I had just a taken a workshop and did a model call to try out my new techniques and several people referred this family to me. Momma is a teacher and Dad is a local church pastor. These people have hearts of Gold. They have become some of my favorite people to see. Fast forward two years, and not only has my skills grown in ability (Thank the Lord!) but Momma is pregnant with baby Norah. Ya'll I think all women are gorgeous but Hannah is stunning when she is pregnant. She literally glows. We got together for their family mini session right before the holidays and I still swoon over this session. Finally Norah arrived! I saw her when she was only fourteen days new. She rocked her newborn session like a champ, and her big brother Peter was so excited to have a younger sister. Norah's parents asked for my simple neutral style with a hint of florals....... And the turn out was beautiful. This makes me want to start using florals at more sessions! Little Norah is precious, Congrats again Rivera Family! To say that babies have their own agenda would be an understatement. To say that birth almost never goes as planned would also be completely true. This mama was one of my last birth mama's before I took a break to go back and finish my nursing degree. And I was so blessed to be a part of her birth team. All women work incredibly hard to bring their babies into the world. But Bethany was one of the hardest working mamas that I have ever seen. It was an adventure but it certainly did not follow anything that she had hoped for. Bethany had dreamed of a beautiful home birth. But a series of unfortunate events changed her birth plans. A couple days before Tavish was born, mom Bethany was driving to an ultrasound appointment when she was in a small fender bender. Small as in less than eight miles per hour and no vehicle damage. She called her midwife and followed all of her instructions. An ultrasound and non-stress test showed that Tavish and Mom were both fine and she was able to go about her day. Until that evening when mom started having terrible abdominal paid. She called the midwife who advised her to head on into the hospital for an evaluation. While in triage, Tavish's heart rate had a quiet few concerning drops. She almost had to have a c-section but Tavish decided to stay put. Labs, ultrasounds, and a few more tests determined something was wrong and it was time for an induction. The next two and half days were filled with persistence, frustration, encouragement, exhaustion and pain. Foley Bulbs and THREE IUPCs (A very painful intrauterine contraction monitor) as well as abdominal pain from the car accident that flared up with each contraction, pitocin, drug reactions, nausea, dry heaving, repositioning, slow dilation progression, oxygen. I'd like to say that was it, but there was so much more. But Bethany kept trekking on. She was persistent and refused to give up, she was going to have this baby damn it! After 36+ hours of slow dilation progression, Bethany was finally at 10cm and allowed to push. She pushed for over three hours. After no progression a tough call was made, Bethany had started to get a fever and the risk of infection was too great. Tavish was showing she was done and the decision for a cesarean was made. Bethany had never been more disappointed, sad, angry, or ashamed in her life. But as Bethany said, "it was my pride or my baby, and my baby will always come first." It always amazes me what we as moms will do for our children. Tavish Georgianne was born 1:10 am on 5/22/17, 7lbs 3oz, 20 3/4 long. She was sunny side up and turned the wrong way, as well as being wrapped in her cord twice. All was well. When she cried, we call cried. But Bethany's journey didn't end there. After Dad, Tavish and I went to the recovery room Bethany hemorrhaged and lost a lot of blood. Thankfully she had a very talented surgical team who had the skills and worked extremely hard to prevent a hysterectomy. Because of Bethany's complication she had a five day hospital stay. During that extra five day stay Tavish was re admitted into the hospital because she seemed to be having seizure activity. She was taken immediately to the NICU for tests and monitoring but is doing ok. A shout out to the wonderful staff who kept Mom & Dad informed and allowed them to continue breastfeeding and caring for Tavish as much as possible. Finally Tavish and her momma get to go home! While Bethany had plans of having a natural home birth and she ended up with three different induction methods, three sets of internal monitors, an epidural, and finally a cesarean. She still got the greatest gift of all time. Bethany shared an amazing piece of advice that a wise woman told her, You can grieve the loss of what you had planned, but You will never regret or forget the hard work and reward of the path that followed. Isn't that amazing and wise?! Each time I attend a birth I come away with more knowledge than when I went in. And this birth wasn't any different. Congrats Mainville Family! Sweet little Tavish is so lucky to have you! But her friend's convinced her that she would regret not getting photos done. And they were right! Three days before Emma made her appearance into the world, Emma's mom, dad and I were on the top of South Mountain taking some gorgeous maternity photos at sunset. Arriving one day after her estimated due date, Emma came into the world with an entrance. What we all thought would be a petite little baby ended up being a whopping ten pound newborn! When I came to the hospital for her fresh 48 session, I literally was in shock on how big she was. I love fresh 48 sessions because it is such an intimate moment of bonding between baby and their family. I met Emma's grandparents and saw their adorable bond with their first grand baby. Emma's grandma was smitten with her. Her grandpa was afraid to hold her! The last time he had held a baby was when Emma's mama was a newborn. Emma's mom and dad could not get enough of this sweet little girl. Three weeks after Emma was born I saw her in the studio for her newborn session. She has some challenges when she got home which is why we waited to do her session. Because Emma was born in the winter time her mama asked for snowflakes to be used somewhere in her session. Her daddy went to Washington State University and we of course had to show off some Huskie gear. 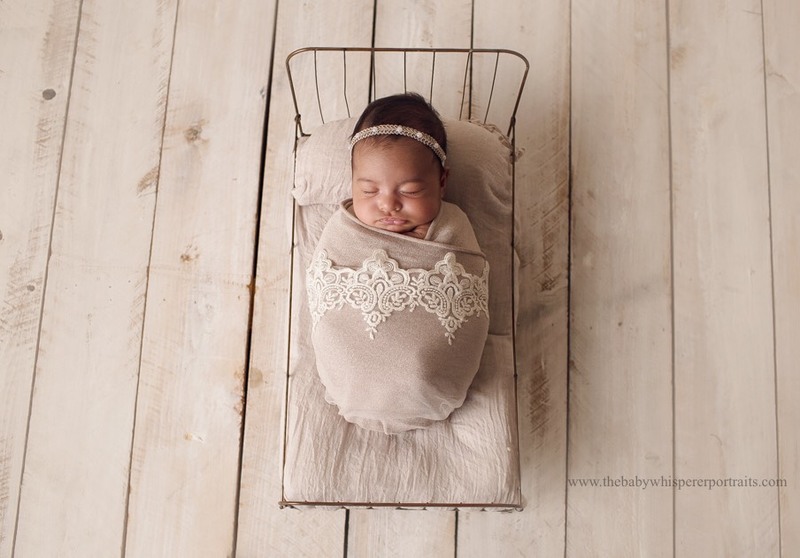 Even though she was an "older" newborn, she handled her session like a champ. We stopped for extra feedings and snuggles but she loved being in front of the camera! I am so blessed when clients choose me to photograph their story from start to finish. We really get to know each other and form a bond. Which makes photographing easier each time! Congratulations Schwartz family! You are truly blessed. Phoenix Newborn Photographer - Mommy and Me Mini Sessions 2017 - What started out as a styled shoot with my idea of a mom and her sweet baby, quickly turned into meeting requests of women who wanted a magical session with their children in that field. Which then made me think, why not do mini sessions here?? And that's what happened....I plan to offer family sessions here in the fall! Keep your eyes open for session details and rates! My sweet friends the Grier family have an amazing story to share, I used Mama Grier if she would guest blog for me about her story and experience. What she wrote literally makes me fall in love with what I do even more. I am truly blessed to have amazing clients in general. But the Grier family touches my heart and soul. "My husband and I have always wanted children, specifically 2 boys!! After 3 years of trying we were ecstatic to finally be pregnant. I was pregnant for 2 months when I lost our first baby. As sad as I was we decided to keep trying. We became pregnant again shortly after I miscarried and went on to have a beautiful baby boy; but because of my miscarriage I never thought about doing any type of keepsake, especially pictures. When our first son turned 1 we decided to try again, and again we had trouble. After years of not getting pregnant and going to fertility doctors and changing our way of living we became pregnant with our second one. Chyanne was literally the 3rd person to know!!!!! I knew I wanted her and only her to go on this journey with us no matter what the out come was. She had done some family pictures for us earlier that year and had taken such an interest in us that our pictures came out exactly how I wanted it. Our experience with Chyanne was incredible. She truly loves the people she works with, she puts her whole heart into taking beautiful photographs. She got to know me and my family and all the pictures she took for us was personal from then on. Thanks again Mama Grier for sharing your journey! I look forward to photographing your family again soon! I love having a friend as our studio stylist! Hannah is amazing and I recently asked her to share her fashion knowledge in a blog since Spring family minis are right around the corner! If you fall in love with the outfits that Hannah has put together, you can now have hannah style your family for your family session! Take it away hannah! Dressing to impress is key when getting professional photos taken. When going to pick out an outfit or sometimes outfits for the family it is important to remember "keep it simple and neutral"
You do not want everyone in matching outfits, rather you want to have the colors and styles coordinate. This is important so you don't end up with those 90's awkward family photos in the matching Levi's & button ups. For example, if you love the idea of jeans have the guys wear jeans and shirts in similar color but one fella could have a patterned neutral while the other has a plain one. The ladies can wear a cute dress or skirt and blouse that coordinates with the colors chosen. Remember that these family photos are meant to hang on your walls or being given out to family members. You are going to want them to be timeless and funky colors or themes may clash with the other decor in your home. Always always always look for inspiration photos of what you are wanting your family photos to look like; BUT this is vitally important, remember you are not the family in those photos. Use them as inspiration for outfit choices & styles. Show them to your photographer so he/she can see your vision & what you are desiring to capture. If you are one of those people who NEEDS some color, not to worry; add a cute sweater or scarf which will add your pop of color in a photo. Color is not a bad thing but too many colors can clash in a photo so make sure to add pops of specific colors or patterns mixed with neutrals in order to get the look you are going for. Since photos are meant to capture your personality as a family, it is encouraged you bring props to incorporate that uniqueness into a few photos. For example, if you love an instrument such as the guitar incorporate that into a few photos. Or if you want to capture your toddlers love for Disney bring her/his favorite toy and have them pose for a few shots. This allow you to capture special moments and times but also get some classic shots in as well. Once you've chosen your outfits, the hard parts done. Now you get to relax and be your beautiful, wonderful selves while your photographer works their magic capturing your individual personalities & family dynamics in photos that you will treasure forever. Is fashion or selecting outfits not your thing? Do not fret because the Baby Whisperer photography offers complimentary outfit help and can point you in the right direction. If you need additional help, you can hire a personal shopper for a small fee to find the perfect outfit choices for your family. Remember dressing to impress is key when taking professional photos.